Published on September 29, 2018 by Rachelle J. My TBR pile is still at 704 books. I finished my library books and started another book for RIP XIII, but I also added a book to my wish list. Into the Wild by Sarah Beth Durst – KEEP. This is an adventure story all about fairy tales, so there’s no way I’m taking it off of my TBR. Hunter by Mercedes Lackey- KEEP. A Dystopian society AND fantastical monsters?! Yes, please! A Better Way to Die by Paul Cornell – KEEP. The synopsis spends more words about how great the author is than about anything concerning this short story collection, which makes me feel extremely skeptical. However, I already own it and Cornell has written a couple of the “Doctor Who” books, so I’ll give it a shot. 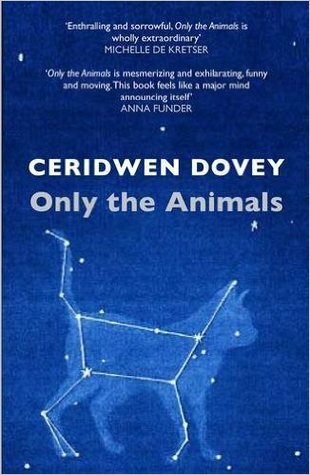 Only the Animals by Ceridwen Dovey – KEEP. This is another short story collection, but with a theme. Each of the stories are told from the point of view of a different animal. I’m very intrigued. A Free Man of Color by Barbara Hambly – KEEP. I bought this book, and the 2nd in the “Benjamin January” series, Fever Season, while the Boyfriend and I were visiting Oak Alley Plantation in Louisiana a few years back. I’m hoping to read it before the end of the year. My to-read shelf is still at 704 books. Hopefully that will change by next weekend, but I’m not going to hold my breath. I went from finishing 4 to 6 books a month to only getting through 2 books in August and 2 books this month. I don’t see that changing anytime soon. This check-in is for September 21st – 27th. I’ve bagged 14 out of 20 Munros in the Munro Step Challenge 2018! The link is to my fundraising page for Bloodwise. My goal is $10 per Munro and there are only 2 days left for me to bag the remaining 6 Munros and raise $200! Will you sponsor me to spur me on? Published on September 24, 2018 by Rachelle J. Total books for the year: 74 of 90. I was looking through the books I had read this year on Goodreads and realized that several of them didn’t have Read dates! I added the dates, and the number of books I’ve finished this year jumped up to 72. I’m now 9 books ahead of schedule for my reading goal, also thanks to finishing 2 books this week, which makes me feel a lot better about not having as much time to read since I started working. Published on September 22, 2018 September 21, 2018 by Rachelle J. My TBR pile is still at 705 books. I’m now trying to finish a couple of library books, and then I think I’ll stick to my own books for the rest of the year. I really want to see my TBR below 700. If that happens prior to January, I might make it a goal of mine to decrease my TBR by 100 each year. Exceptional Advice for Adventurers Everywhere by Joseph J. Bailey – KEEP. I bought a copy of this for the Boyfriend several years ago, and he enjoyed it. I got the ebook for myself, but haven’t gotten around to reading it yet. Cinderella’s Big Score by Maria Raha- KEEP. I’ve had this book for years. I honestly don’t remember when I bought it, but I know it’s been a long time. I’ve read parts of it when I was doing some research for one of my college classes, but I want to read the entire book at some point. The Dirty Parts of the Bible by Sam Torode – GO. The synopsis sounds like the author tried to put too many things into the story to make it interesting. It’s also a self-published book, and after reading the author’s bio as well, I’m definitely not interested. Texas Gothic by Rosemary Clement-Moore – KEEP. This book was recommended to me by a friend. I also miss Texas and the synopsis sounds like this story will be the YA version of Midnight Crossroad by Charlaine Harris. I’m always down for some “Magical Trash”. The Immortal Prince by Jennifer Fallon – KEEP. The Boyfriend bought this for me while we were checking out an independent bookstore in Austin. I’m a little skeptical of the story since the synopsis makes it sound like it might be more of a Romance dressed in Fantasy, but I’ll give it a shot. My to-read shelf is down one to 704 books. I’m hoping that I’ll finish up my library books in time to finish one more book on TBR before the end of the month. Published on September 21, 2018 September 21, 2018 by Rachelle J. This check-in is for September 14th – 20th. I’m 7 Munros into the Munro Step Challenge 2018! The link is to my fundraising page for Bloodwise. My goal is $10 per Munro, and so far I’ve gotten 1 donation. Now that I’ve gotten comfortable with walking regularly, I’ve added back in a step goal of 50K steps per week. Published on September 17, 2018 by Rachelle J. Total books for the year: 65 of 90. This was another week where my reading time was frequently interrupted by life *sigh* I hope this week will be better. Published on September 15, 2018 by Rachelle J. My TBR pile is still at 706 books. I’m slowly catching up on my favorite blogs, and that means I’m finding books to add to my wish list. The Very Best of Charles de Lint by Charles de Lint – KEEP. De Lint has been recommended to me many times, but I had no idea where to start until I found this book. The author or an editor didn’t choose the stories in this collection; instead, de Lint asked his fans for their favorites. I’m hoping he’ll become a new-to-me favorite. Auraria by Tim Westover- KEEP. I’m a bit skeptical about this one. However, it’s set in a ghost town in the Southern Appalachians in Georgia so I’m intrigued enough to give it a try. Anni Moon and the The Elemental Artifact by Melanie Abed – KEEP. This appears to be a classic Middle-Grade Fantasy Adventure, and I rarely ever turn down one of those. The Luck of the Weissensteiners by Christoph Fischer – KEEP. First off, I love the cover. Secondly, this is a WWII story set in Eastern Europe in a bookstore, which is another type of story I rarely ever turn down. Fire and Ice by Patty Jansen – GO. With such a completely unoriginal title, I’m afraid the story will be wholly unoriginal as well. The synopsis makes it seem like it could be a decent book, but the reviews confirm my fear. No, thanks. My to-read shelf is down one to 705 books. I’ll be spending most of this weekend reading, so I hope that number will be a little lower next weekend.